How to Buy Houses using Housing.com? Housing.com is a real estate portal which has brought about a change in the way people search for properties online. This portal has persuaded users to believe that property can be searched online with enough reliable information to consider a purchase. The overall functioning and features of the portal is data driven which allows users to study numerous aspects of the properties and property trends before making a purchase. To understand how housing.com facilitates searching for homes, let us take an example where a person plans to purchase an apartment for sale in Bangalore. The buyer would have a certain type of house and an associated lifestyle in mind when planning the purchase. First of all, this buyer wants the ability to find houses with certain amenities that would meet his/her needs. Then there is the need to know more about the locality and available amenities in the vicinity. A more investment oriented buyer would like to know about the prices of properties in the said locality; the available inventory in the area and the overall demand trends in the region. Housing.com addresses the buyers’ needs in three ways. Once a person chooses a property to view, the portal offers a comprehensive insight into a property along with the available amenities in one place. The monitoring of the macro-economic conditions is enabled by a department within housing.com- called Data Science Lab; or DSL for short. DSL works constantly analyzing data related to demand and customer activity to identify the trends and requirements of home buyers. This analysis is either interpreted as a service opportunity or translated into user friendly information which is then presented on the housing portal for all to view. As a result of the comprehensive DSL analysis, housing.com today allows sellers to post properties, and other users to find properties for purchase as well as renting. One can find PG Accommodations and property agents also from this portal. Someone who has already found a house can go for home loans and someone who has found a house to buy in Bangalore with housing.com can also opt for its rental agreement services. Additionally the DSL maps and features allow users to know more about the property trends in various territories. How to search for a home? 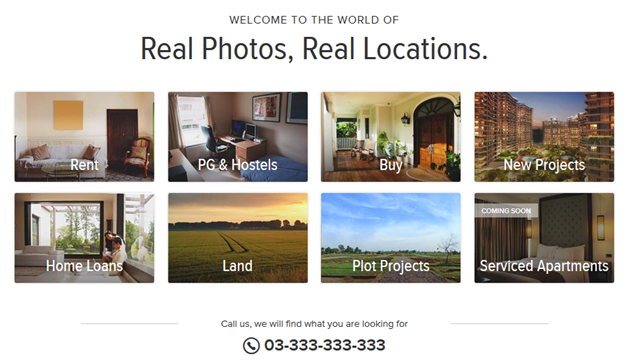 When one visits the housing.com home page, the very first thing that shows up is a group of houses that highlight the various categories of services that the portal offers. Users see small photographs marked ‘Buy’, ‘Rent’ ‘New Projects’, ‘PG & Hostels’, ‘Home Loans’, ‘Land’, ‘Plot Projects’ and ‘Serviced Apartments’. Those planning a purchase can click the photograph marked ‘Buy’. The search option allows a user to enter a locality name and the auto-fill option presents numerous options. Choosing the right one and selecting the basic filters of number of rooms and price range leads to the result page. This page displays the properties on a map of the locality. Here the buyers can make use of additional filters like built-up area, choice of amenities, seller type etc. to further filter the results. Clicking on an icon brings up the property specifications which comprise of the price, available amenities and verified photographs of that house. Additionally, an overview of the locality is provided using a ‘Lifestyle Index’ score along with the details of amenities in the vicinity. One can shortlist a property here for comparison or contact the seller from here. Housing.com addresses customers’ concerns and provides its services accordingly to ensure that buyers find it easy to find and purchase properties of their choice.